Norwich born butcher Thomas Tebbutt Cunnington can be seen on the 1861 census in Wellington Street and then on subsequent censuses in Wellington Street next to Albion Street until his death in 1889. William John Harper (b. 1868 Barrington), the great-grandfather of Grant Powter (owner of Powter's Butchers) came to Newmarket in 1881 as an apprentice to Thomas. 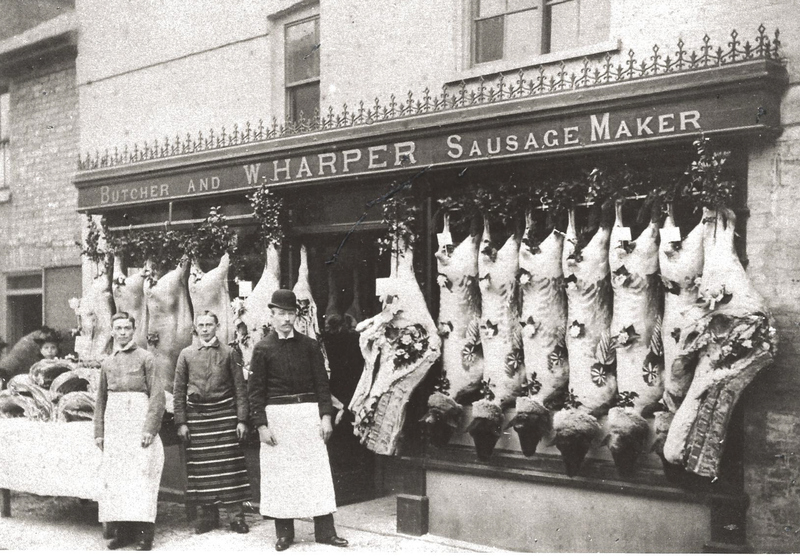 When Thomas died in 1889 he left his estate to his second wife Eliza who carrried on managing the butchers for a few years with William as butcher's foreman. William appears to have taken over the shop; as in Kelly's Directory of 1892 he's shown as owning his own butchers in Wellington Street. Interestingly on the 1891 census William is working alongside another butcher's apprentice - Frank Edwin Musk (aka Edwin Frank Musk), younger brother of James Musk, who later became the owner of Musk's Butchers. It appears that sometime after the above photo was taken and before October 1900 William moved his shop to the building next door on the left and after he retired that shop became Murton's Butchers. This particular building became Mitson's Cycle shop in October 1900. William's business was next owned by son-in-law Herbert 'Horace' James Hawes, renamed H.J. Hawes Pork Shop and moved to its well-known location next to Drapery Row. Subsequently Ken Powter took over the Pork Shop from his father-in-law in 1965, re-named it again to Powter's and moved it to its present location in No.11 Wellington Street.